On 11th March 2016 the Advanced Condition Assessment and Pipe Failure Prediction Project received the award for best Research Innovation 2016 from the NSW division of the Australian Water Association. Sydney Water coordinated the preparation of the submission on behalf of the Project partners and AWA Member Dammika Vitanage submitted the nomination. Our Project is now in contention for the Australia-wide award which will be announced at the Ozwater16 Gala Dinner in Melbourne on 11th May. 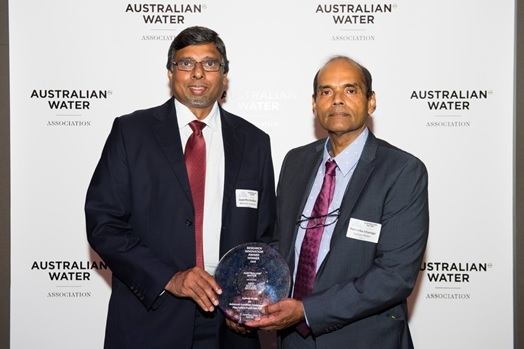 The photograph shows Chief Investigator Jayantha Kodikara (L) of Monash University and Industry Partner Representative Dammika Vitanage (R) of Sydney Water holding the award trophy.